Many are questioning the decision by a current presidential candidate (the one calling itself “Jeb!”) to showcase a failed former president (the one known as “W?”) in his campaign. As Jeb Bush stumbles his way to blowing eleventeen gazillion dollars for the opportunity to lose to Hillary in the 2016 presidential race, a number of people have questioned some of his decisions. First, there was his choice to waste wads of money, liquidate all that lucre, chuck so much cash, and, well, you get the idea. Second, there was his curious choice to refrain from obtaining a name change. 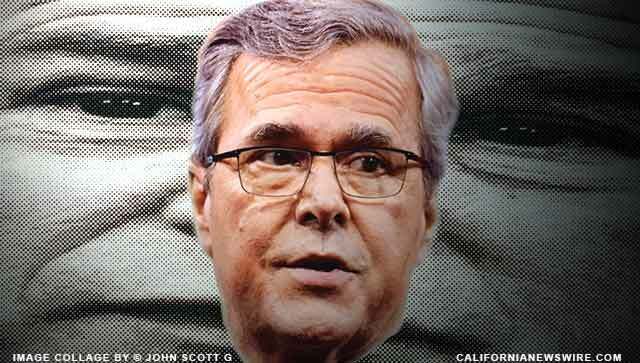 Compounding Jeb’s problem with the “shrub” appellation is the inclusion of his brother in campaign commercials. Yes, they dug George W. Bush out of mothballs, cleaned up the paint stains, wiped the drool from his lips, and put him in front of some cameras to tout Jeb as being a good choice for president. Suddenly, unsuspecting voters in primary states are being confronted by the smirking visage of the Worst President in Modern Times assuring viewers of the wisdom of voting for Jeb. “Remember, he was always supposed to be the smarterest one,” W said with extreme confidence. That’s correct: confidence. Perhaps it is similar to W’s confidence about the existence of weapons of mass destruction. Or his confidence about how to run the economy. Or his confidence in his ability to paint better than a three-year-old. * Would you consult the designer of the Hindenburg on air travel safety? * Would you quote George Armstrong Custer on troop strength? * Would you seek the insight and guidance of the tacticians who planned the Charge of the Light Brigade? Jeb’s decision-making is on the same level as his speaking ability and clothing style choices. Perhaps we’re supposed to admire how much he loves his idiotic brother but the whole sad mess seems analogous to PETA turning to Michael Vick for support. Unless Jeb is hoping to look better by comparison (“He can’t be worse than W!” might be the campaign slogan) it is hard to understand this move. We reached out to the Bush campaign and asked what they were thinking.